Mrs Clare's Books: Contest over at Bitten by Books for fans of Kylie Griffin! Contest over at Bitten by Books for fans of Kylie Griffin! Remember when super awesome author Kylie Griffin stopped by to chat with us here at Mrs. Clare's books? 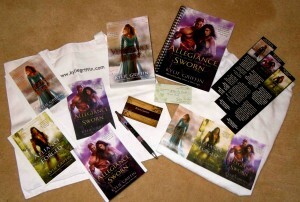 She's giving away a JAM-PACKED Light Blade SWAG pack over at bitten by books. Head on over. You don't want to miss this. If you are an author and wish to have your book reviewed by me, please contact me at mrsclaresbooks@gmail.com. I have no genre or publishing restrictions at this time. Share book reviews and ratings with Mrs. Clare, and even join a book club on Goodreads. I laughed. And I cried. And I laughed some more. I got yelled at by my boss for laughing too loud at work. And then I was crying so hard I couldn't breathe. It was fantastic. A-flippin-mazing! Loved it. Darynda Jones is so funny.